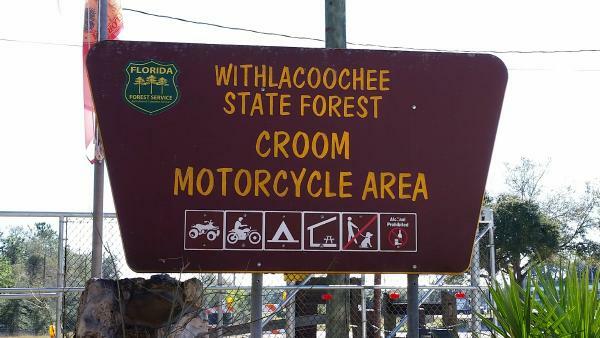 Located within the Croom Tract of Withlacoochee State Forest near the intersection of I-75 and State Road 50, the Croom Motorcycle Area is a playground for off-road motorcycle and all-terrain vehicle (ATV) riders. The 2,600 acre tract has miles of dirt roads, gullies, dry lake beds and forest to navigate. 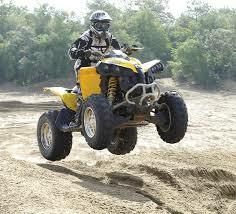 Note that all off-road vehicles must be less than 50 inches wide and less than 1,200 pounds in this area. All vehicles must be titled, and approved helmets must be worn. A substantial annual permit fee is required for each vehicle. Jeeps and 4x4 trucks are not permitted on the trails. As a nature lover at heart ... I have to view the Croom Motorcycle Area as the "sacrificial lamb" of the Withlacoochee State Forest ... designed to provide a playground for off-road vehicle enthusiasts - so they won't disturb the other more pristine areas. Nothing in the State Forest literature indicates such a rationale ... and, in fact, many of the animals including deer, wild turkey, gopher Tortoise, and a variety of raptors, have learned to live with all the commotion. The area is very popular - especially on weekends. It is open during daylight hours, seven days a week. Within the Croom Motorcycle Area, there are two day use areas; the Sand Hill day use area is near the entrance at the south end of the tract, and the Hammock day use area is near the campground. The Buttgenbach Mine campground provides a space for 51 tents or RV's, complete with water, electricity, restroom and shower facilities, and an RV dump station. There is also an amphitheater at the campground which is occasionally used for programs, or may be rented.